Taking away your sense of sight, says Aoe, forces you pay more attention to your other senses of taste, smell, hearing and touch, and so you experience eating a meal in a completely different way. While sitting in the unusual setting of a temple room surrounded by people you don’t know, your level of awareness of everything involved in the act of eating a meal is significantly raised. Rather than just eating in perfunctory way, you become completely focussed on every moment of eating: the feel of the different textures of the ingredients, the different sounds of the food as you bite into it, trying to imagine what it is you are eating, etc, all contribute to experiencing the meal on a completely new level of appreciation. Eating becomes a meditation. 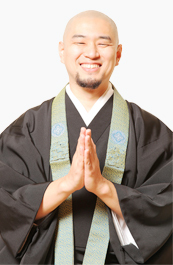 Rev Aoe has also published several cookbooks about shojin-ryori.